Since the earliest days of the DTO’s existence, we’ve been open about taking inspiration from government organisations that have tackled digital transformation before us. 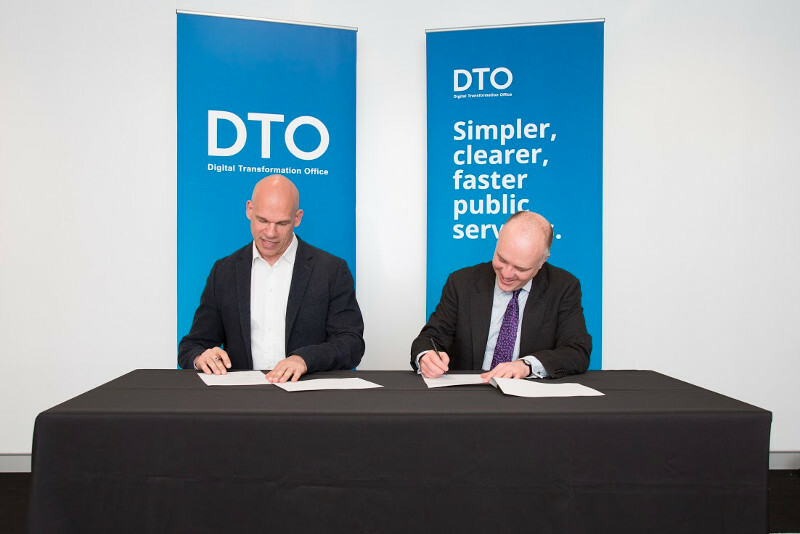 Caption: DTO CEO Paul Shetler and the Chief Technology Officer HM Government in the UK formalise the agreement between Australia and the UK. In fact, our own Prime Minister has said “if plagiarism is the sincerest form of flattery, then [the UK Government] should feel very sincerely flattered … ”. We’re part of a worldwide movement of governments facing the challenges of meeting user expectations, and using the opportunities that are available to us. There are valuable lessons to be learned from the experiences of our counterparts overseas. So it was quite an occasion for us when Liam Maxwell - Chief Technology Officer for HM Government in the UK - visited our Canberra office during his recent visit to Australia, to sign a Memorandum of Understanding (MOU) that will formalise and strengthen the relationship between our two organisations. Liam visited Australia to hold a series of government and partnership meetings as well as attend a number of speaking opportunities, with a mission to build closer ties between Australian and UK digital leaders. As part of this, we’re delighted he was able to find time in his (tightly packed!) schedule to check out the work we’re doing and catch up with some of his former colleagues who are now working with us in Australia. Agreement on common goals. These include building digital public services that are so good, people prefer to use them; providing sufficient support for those who have limited digital capabilities or accessibility issues; promoting economic growth and opportunities for businesses; and, encouraging open source software and solutions. Maintaining communication and exchanging information through, for example, secondments of staff between the two countries and collaboration with other institutions on joint projects. Our CEO, Paul Shetler, has often said he believes Australia has the best digital opportunity in the world right now. “I really believe Australia is perfectly positioned to be a world-leader in digital transformation. This MOU cements our plans, and outlines some of the opportunities to share expertise and work on common problems together, that will help bring that vision to life,” he said. “Our efforts to transform government services in Australia have already benefitted immensely from collaboration with colleagues across the APS, across the tiers of government, and across the globe. And I’m very much looking forward to the the opportunities that will arise from this MOU, giving our staff and staff from other government agencies the chance to benefit from this shared knowledge and experience. “Working more closely together can only help us in our efforts to improve the lives of the citizens in our respective countries,” said Paul. Liam also said the MOU builds upon a long-tradition of collaboration between the UK and Australian governments. “The GDS was founded in 2011 so we’ve had a little more time to progress along on the path to digital reform. However, I’m genuinely impressed and excited to see the work that’s been done by the Digital Transformation Office in such a short period of time, and can’t wait to see what comes next,” said Liam. “And I’m very pleased this MOU means we’ll be working more closely together throughout that next phase and beyond. The UK is, of course, a founding member of the Digital 5, and I do think - and look forward to the day when - we can become a Digital 6, with the inclusion of Australia,” he said. The signing of the MOU with Australia follows similar agreements the UK has signed with New Zealand, Estonia, South Korea and the United States. The MOU takes effect immediately and will be in place for an initial period of five years. It will be reviewed (at least) annually, and is expected to evolve as both organisations progress in their work.